Are you finding yourself in front of the PC too many hours at night or when it’s dark? Maybe you’re doing work or just catching up with friends. The problem is the bright light from the display may be impacting your sleep and causing eye strain. Fortunately, there is a free utility that minimizes this problem. The program is called f.lux and is from the same folks who brought you Google’s Picasa. F.lux works in the background and adjusts your computer monitor’s color temperature throughout the day. This is different from an ambient light sensor which looks at the brightness of light in your environment. According to the developers, the program makes “the color of your computer’s display adapt to the time of day, warm at night and like sunlight during the day. The result is the monitor better mimics the natural environment. I find I have less eye fatigue. There is also research suggesting that the bright lights from the computer monitor can interfere with your sleep. In the screen snap below, you can get the idea of the wave-like movement over the day. The program is easy to install and relies on a few information points. To start, f.lux needs to know where you are located so it knows when the sun rises and sets. 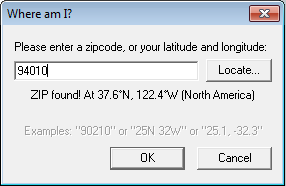 This is done by either entering your ZIP Code or your latitude and longitude coordinates. For most people, that is all you need to use the software. F.lux will use your computer’s clock to determine your location’s sunrise and sunset. You can make more tweaks to the program such as changing the transition speed or the lighting with the slider controls. The color temperature transitions are very natural and I think reduces my eye strain. I’ve only had two minor issues with the program. The first is I took some SnagIt screen shots in the late evening and they were not as bright as normal. I didn’t realize this till the next day when the screen was normally brighter. I’ve since learned that f.lux has an option to disable for an hour for this reason. And if you keep the default fast transition speed, you will know when the sun set. Some people may prefer to change the transition speed to be a bit slower so it is not as noticeable. I’d encourage you to try F.lux. I think you will find it makes working on your PC at night easier and it minimizes the glare that often creates eye strain and keeps us awake. If you find the program useful, consider donating to their Charity Water drive. You’ll see the donation link in the top right corner of their websites. F.lux is one of those programs that anyone who is in front of a computer at night should use. It automatically adjusts the screen brightness of your monitor throughout the day. This makes it easier for your eyes to adjust and to get ready for sleep.